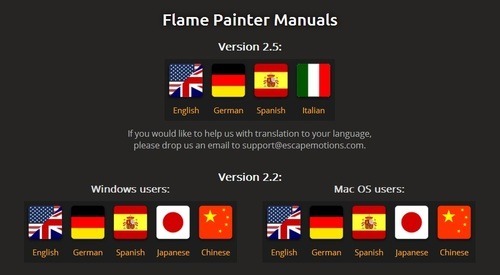 With these translations we expand our manual collection thanks to you, our dedicated users and fans. For a version 2.2 there are Japanese and Chinese translations to choose from as well. 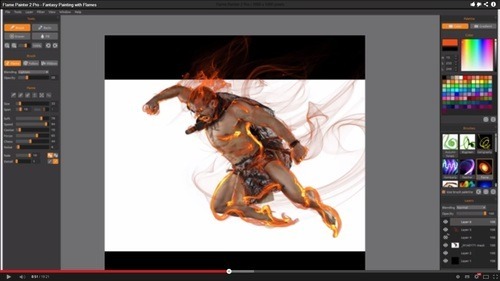 Moreover, to make things clearer with these flames in your computer :), Vladimir Chopine created a new tutorial series for Flame Painter 2 Pro. Interface Overview - top navigation drop-down menu; other menu: Tools, Palette, Brushes, Layers Panels; creating a new file with specific features: size, background layer and dpi; customizable interface with dockable tabs: how to drag, resize, move and hide panels. Workspace and Layers Panel - how to draw a brush stroke; how to navigate in the workspace; how to work with layer; how to add and work with vector layer; blending modes: Normal, Darken a Lighten; opacity settings. Tools Panel - introduction to the tools panel: Brush, Basic, Eraser, Fill tools; brush tool; variety of the tools: Flame, Follow, Ribbon and their settings: “Size”, “Span”, “Soft”, “Speed”, “Center”, “Focus”, “Chaos”, “Noise”; Normal and Supersmooth Antialiasing; "Fade" and “Details” settings. Brushes Panel and Presets - how to add, remove and share brush presets; filter menu: “Blur”, “Glow”, “Tile layer”. We hope you’ll find these manuals and tutorials useful. Let us know your thoughts and stay creative!